You are here: Home / 2014 / July / 31 / The challenge is complete!!! 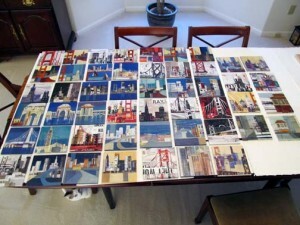 Finished my last painting for the 50/50 challenge yesterday, it was a great feeling.For those of you who haven’t read my earlier posts the Sanchez Art Center accepted 69 artists to each paint 50 paintings in 50 days on the subject of their choice.My subject was Semi abstract San Francisco structures, bridges and skylines. This challenge felt like art boot camp but has really helped me develop as an artist.They say to get better at painting you need to paint lots, well I definately painted lots the last 7 weeks .What was really encouraging to me was that my last 8 were my favorites. Now to tidy up edges, spray the surfaces with varnish and sign them so they are ready for the big show, I can’t wait to see them all hung together.This should be a fun show to visit Aug 22-Sept 28 at Sanchez Art Center, 1220 Linda Mar Blvd, Pacifica, California. Gallery hours Fri,Sat, Sun 1-5pm and by appointment.